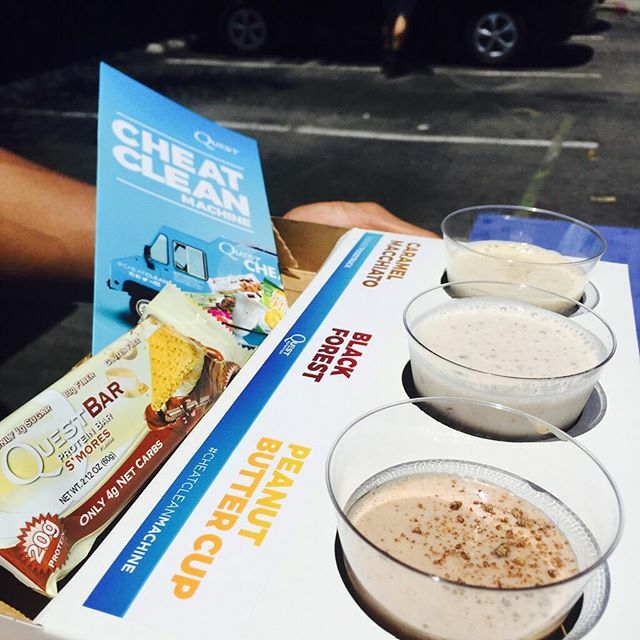 Quest is using the “CheatClean Machine” to give away free protein shakes. At the beginning of the summer, Quest Nutrition quietly rolled out a total game changer. It makes stupidly delicious protein shakes. And it gives them away for free. Let me repeat that: FREE protein shakes, brought to you by a truck that looks like this. Yup, Santa Claus is real. 1. A “revolution on wheels?” I see what you did there, and I like it. 2. Only Los Angeles? What did they do to deserve this bounty? 3. The world’s best-tasting protein shakes? Bold claim dude. …except it’s not because the shakes are incredible. Tons of protein, incredibly low carb, and they taste like what I imagine protein shakes taste like in heaven. A really buff heaven with free Equinox memberships for everyone, and angels that look like Arnold. *Caramel Macchiato tastes like an honest-to-God coffee frappe, but with protein. *Black Forest is like Ben & Jerry’s Cherry Garcia in milkshake form. *And PB Cup is like “I want to drink only this forever.” If you couldn’t tell from the name, it tastes like a Reese’s, or a Butterfinger -- but shakier. Apparently they had Maple Bacon shakes at the CrossFit Games. BACON PROTEIN SHAKES! I know. This truck is magic. If you want to try making the shakes at home (even though the truck gives them away for FREE), they’ve got recipes for all three shakes, and a bunch more in the Quest Cookbook. All the shakes require Quest Protein Powder, obviously. That’s the not-so-secret ingredient -- totally unique protein powder flavors like Salted Caramel. Quest is basically taking everything we love about Quest Bars and turning them into protein shakes, and I'm not complaining! 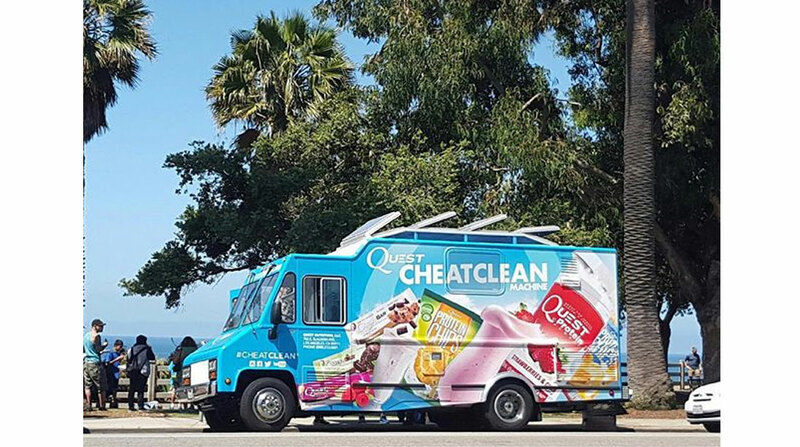 If you’re local to Los Angeles and planning on stalking the CheatClean Machine everywhere it goes (totally understandable) they post upcoming locations on their website, and on their Instagram @QuestFoodTruck. You can follow Quest @QuestNutrition and order powders directly from QuestNutrition.com. You can also begin flooding their page with requests to get the CheatClean Machine in your city, because seriously, Los Angeles isn’t worthy.